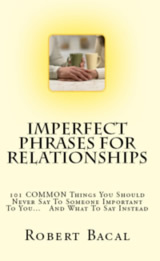 Sharpen Your Communication Skills: Good communication is key in any relationship. Improve your communication skills and see how your relationships at home and in your workplace will benefit. Read tips on communicating with your children that will help you understand them and let them get to know you better. Learn how to ask for what you want and need at your workplace, and set a good example for the rest of your office. Your presentations will become compelling after you review some of the articles associated with this category. Non-verbal communication is critically important in building and maintaining positive relationships. Learn more about all aspects of non-verbal and para-verbal communication.